- Soft start circuit that slowly increases the current draw. - Revised power supply with lower noise. - Increased AIR boost to 6 dB. - Fully balanced Line input pad. 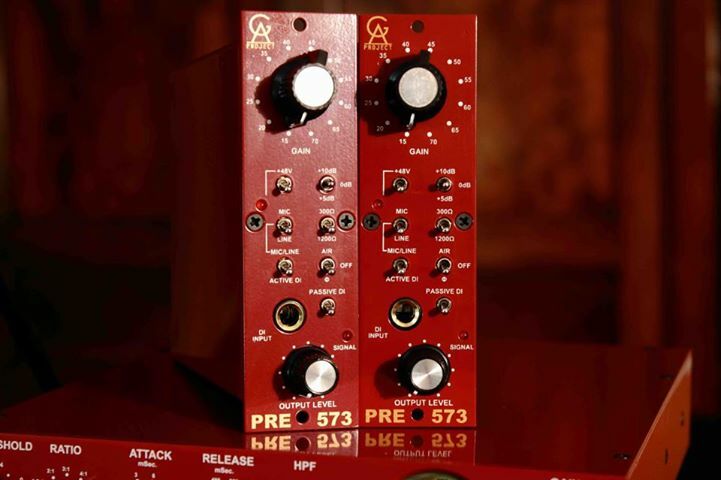 The PRE-573 MKII is a one width module for the api 500 format that has the sound and the features that made the PRE-73 so successful and a few additional ones. The circuit still uses the preamp and output section from the classic 1073-module, adapted to work in the api rack format. It has a total gain range from -10 to +80 dB. The 20 – 70 dB range is handled by a turn switch and there is a separate toggle switch to select an additional 5 or 10 dB gain. 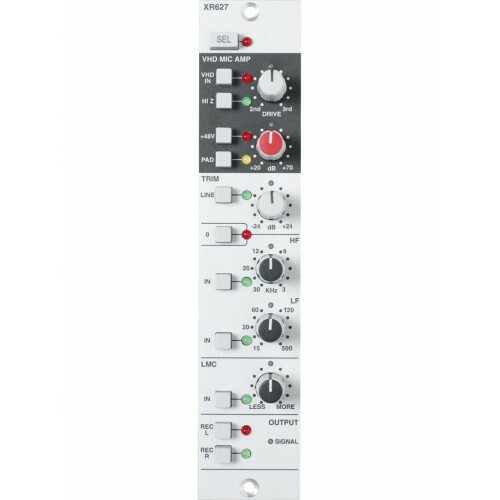 The input can be configured to accept line level signals by another switch, the gain is then lowered by about 30 dB and the input impedance increased to about 10 kohm. The input impedance of the mic input mode can be switched between 1200 and 300 ohm. Phantom power and phase reverse is also selectable by front panel switches. An added feature, using the same circuit as in the PRE-73 DLX, is the active DI-input with a high input impedance of about 1,5 Mohm. The output signal from the active DI circuit passes through the input transformer for some extra character. The DI-input is very flexible since it can be changed to a purely passive one by a front panel switch. The DI input is then exactly the same as in the PRE-73 MKIII where the signal is feed directly into the second gain stage, bypassing the transformer and with an input impedance of about 100 kohm. These two DI-options makes it possible to get different tones from electric instruments and the passive DI input mode is more suited for injecting active units like sound modules. A new feature is the switchable AIR mode that adds a boost above 10 kHz that peaks at 6 dB around 30 kHz. A simple but effective signal and overload indicator is offered by a single LED that starts glowing red at about +4 dBu and then increases its intensity up to the maximum output level. The PRE-573 MKII has a dedicated insert connector at the back allowing it to interface with other GAP 500 modules. The insert can be activated by removing a jumper connector at the back of the module. The EQ-573 consists of the inductor based high pass filter section and the 3-band eq section from the classic 1073 module with some added frequencies. These two modules together will offer a fully fledged 1073-module in a compact format at a very low cost. There is a second jumper at the back of the module that selects 600 ohm termination on the output. 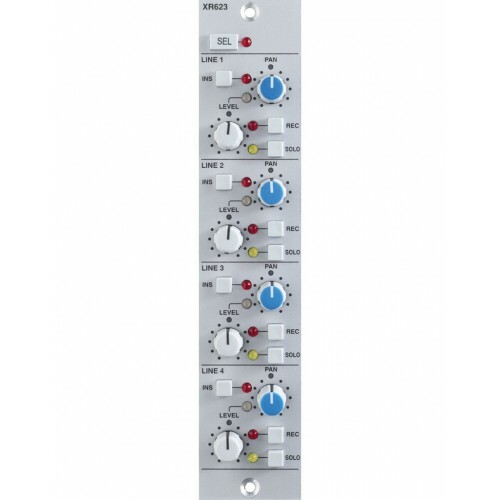 The standard mode is termination on, since it gives the flattest response when the PRE-573 MKII is used with modern line inputs that typically has an input impedance of 10 kohm or more. The user can chose to remove the jumper and deactivate the termination resistor, this will increase the level above 10 kHz and create a peak in the response for an even more pronounced “Air” effect. The output is transformer balanced and fully floating and can drive a 600 ohm load up to level of about 28 dBu. - The total gain range goes from -10 to +80 dB. The 20 to 70 dB range (in MIC mode) is handled by a turn switch and a toggle switch selects an additional 5 or 10 dB gain. - Switchable impedance on the mic input, 1200 or 300 ohms, will change the tone of many mics. - The input can be configured to accept line level signals by another switch, the level is then lowered by about 30 dB and the input impedance increased to about 10 kohm. - Switchable phantom power with a LED indicator. - A flexible front panel instrument input for electric guitar or bass that can be selected between a high impedance Active or a mid-Z Passive mode. These two DI-options makes it possible to get different tones from instruments. Mains connected sound modules or other signal sources should be connected to the MIC/LINE input of the 500-rack, unless they have a fully floating, transformer balanced output stage. - Insert jack for inserting Golden Age Project 500 Series effect units. The insert is activated by removing a jumper at the back of the module. - A soft start circuit that ramps up the supply voltage slowly (about 10 sec.) to avoid a power-on current surge. - Selectable AIR equalizer adds a boost of about 6 dB centered at 30 kHz. - A simple but effective signal and overload indicator is offered by a single LED that starts glowing red at about +4 dBu and then increases its intensity up to the maximum output level. - Selectable 600 ohm Output Termination at the back of the module.